The neonatal murine retina provides a well characterized physiological model of angiogenesis, which permits investigations of the roles of different genes or drugs that modulate angiogenesis in an in vivo context. Immunofluorescent staining to accurately visualize the vascular plexus is pivotal to the success of these types of studies. Tual-Chalot, S., Allinson, K. R., Fruttiger, M., Arthur, H. M. Whole Mount Immunofluorescent Staining of the Neonatal Mouse Retina to Investigate Angiogenesis In vivo. J. Vis. Exp. (77), e50546, doi:10.3791/50546 (2013). Angiogenesis is the complex process of new blood vessel formation defined by the sprouting of new blood vessels from a pre-existing vessel network. Angiogenesis plays a key role not only in normal development of organs and tissues, but also in many diseases in which blood vessel formation is dysregulated, such as cancer, blindness and ischemic diseases. In adult life, blood vessels are generally quiescent so angiogenesis is an important target for novel drug development to try and regulate new vessel formation specifically in disease. In order to better understand angiogenesis and to develop appropriate strategies to regulate it, models are required that accurately reflect the different biological steps that are involved. The mouse neonatal retina provides an excellent model of angiogenesis because arteries, veins and capillaries develop to form a vascular plexus during the first week after birth. This model also has the advantage of having a two-dimensional (2D) structure making analysis straightforward compared with the complex 3D anatomy of other vascular networks. By analyzing the retinal vascular plexus at different times after birth, it is possible to observe the various stages of angiogenesis under the microscope. This article demonstrates a straightforward procedure for analyzing the vasculature of a mouse retina using fluorescent staining with isolectin and vascular specific antibodies. Angiogenesis is a complex developmental process defined by the formation of new blood vessels from a pre-existing vessel network and is regulated by several signalling pathways. The most prominent of these is the VEGF pathway. VEGF is released by ischemic cells and leads to the initiation of angiogenic sprouting in neighboring blood vessels. The leading endothelial cell from a new vascular sprout is a 'tip' cell, which produces filopodia that reach out towards the source of VEGF, and is followed by proliferating 'stalk' endothelial cells. In this way, activated endothelial cells migrate and proliferate towards an avascular region where they form new vascular tubes. In order to stabilize these tubes to support blood flow, endothelial cells interact with pericytes and smooth muscle cells, which surround the new blood vessels 1. Angiogenesis is essential for vascularization of the embryo and growing tissues. However, it also contributes to many pathological disorders such as cancer; whereas defects in angiogenesis are associated with ischemic diseases. The development of effective drug treatments to regulate angiogenesis as a means of treating disease is therefore of great interest. For example, effective anti-angiogenic factors will reduce cancer growth, whilst pro-angiogenic strategies can be used to treat ischemic disease. Thus, models of angiogenesis are essential to better understand the regulation of new vessel formation and for developing new therapeutic strategies to enhance or decrease vascular growth. A fundamental element of angiogenesis research is the choice of an appropriate vascular model. Many in vitro models have been designed to reproduce the basic steps of angiogenesis such as endothelial cell migration, proliferation and survival 2,3 . A frequently used in vitro assay is the formation of a branched network of endothelial cells on a Matrigel matrix, although this is not specific for endothelial cells, nor does it usually incorporate the support of pericytes or smooth muscle cells. Assessment of ex vivo sprouting angiogenesis using mouse organ culture such as the embryoid body assay, the aortic ring assay and the fetal metatarsal assay allows the analysis of angiogenesis of endothelial cells in the context of additional supporting cells. However, the main limitations of these assays include the lack of blood flow and the regression of vessels over time, giving a limited window for analysis. Therefore, to understand the regulation of angiogenesis more accurately, in vivo models are required such as those developed in mouse using subcutaneously implanted sponges or matrigel plugs, as well as the hind limb ischemia model. However, these models are challenging to analyze due to the complex 3D architecture of the neovessels. In contrast, the zebrafish embryo has proved an excellent model for visualizing angiogenesis in the whole organism 4. However, the mouse is evolutionarily much more closely related to human than zebrafish, making the mouse a preferred model in many cases. Consequently angiogenesis of the postnatal mouse retina represents a well characterized method of choice for angiogenesis research. It not only provides a physiological setting, but also a 2D vascular plexus that can be readily visualized using appropriate fluorescent stains. The architecture of the vessel network, endothelial proliferation, sprouting, perivascular cell recruitment and vessel remodelling can all be investigated using this technique. In the neonatal mouse retina, development of retinal blood vessels occurs in the first week of postnatal life. Mice, unlike humans, are born blind and the retinas only become vascularized after birth. Retinal vessels arise from the center of the retina close to the optic nerve at postnatal day 0 (P0), and develop by angiogenesis to form a highly organized vascular plexus that reaches the retinal periphery by approximately P8 5. Blood vessels develop in a characteristic manner with the capillary plexus gradually growing outward from the optic disc toward the periphery to generate a regular alternating pattern of arteries and veins with an intervening capillary network. The retinal vasculature provides an ideal model to study angiogenesis as the vessels can be easily identified as they grow in what is essentially a 2D plane, thus making it relatively easy to examine the retinal vasculature in flat-mount preparations 5. A method for isolating the mouse neonatal retina for analysis of endothelial tip cell responses over several hours ex vivo has been reported 6. Alternatively, a more detailed investigation of the whole retinal vasculature and associated vascular markers requires immunostaining of fixed retina specimens at different stages of development. Here we provide a detailed description of a reliable and technically straight forward method that we use for whole mount staining of the murine retinal vascular plexus, from the initial enucleation of the postnatal eye (see also 7) through the staining protocols to final imaging under the microscope. All steps are performed at room temperature, unless otherwise indicated. Place humanely killed mouse pup on its side, remove the skin covering the eye with scissors. Use scissors and forceps to enucleate the eye. Place scissors below the enucleated eye, cut the optic nerve and surrounding tissues and lift out the eye. Transfer to a 24-well plate containing 4% paraformaldehyde (PFA) made up in 2x PBS at room temperature. Allow each eye to fix for 10 - 15 min, then transfer to cold 2x PBS on ice for 5 - 10 min. It is best to stagger enucleations and subsequent fixation to ensure the degree of fixation is equal for each eye. Transfer eyes into a Petri dish containing 2x PBS using a plastic Pasteur pipette that has been cut to widen the bore and place under a dissecting microscope. Remove any fat around the eye using forceps and scissors. Pierce the edge of the cornea with sharp scissors and cut around the cornea and iris and discard. Insert forceps between retina and sclera and remove the sclera taking care not to tear the retina. The choroid layer can also be removed, but if there is a risk of damage to the retina occurring during this step, the choroid layer can be left on as it should not significantly affect the quality of the immunostaining. Remove the lens and the vitreous humour using forceps. Remove the hyaloids vessels by gathering them together in the center of the eye with fine forceps then quickly pull away from the center of the retina (alternatively snip at base of hyaloid vessels with fine scissors). Rinse the cup shaped retina with PBS in a clean Petri dish. Make 4 to 5 radial incisions reaching approximately 2/3 of the radius of the retina using spring scissors to create a 'petal' shape. Draw off PBS using a Pasteur pipette to flatten the retina, and then remove any excess PBS with a small piece of absorbent paper. Slowly pipette cold (-20 °C) methanol drop by drop onto surface of retina until totally covered and then flood with additional methanol. This will help to fix the retinas and will facilitate permeabilization. The retinas will turn white. Transfer to a 2 ml tube using a plastic Pasteur pipette that has been cut to widen the bore. Leave retina in cold methanol for at least 20 min before proceeding with immunostaining. Of the antibodies used here, only VE-Cadherin cannot be used successfully on methanol fixed retinas. In this case retinas need to proceed straight to immunostaining after step 9. If required, retinas can be stored in methanol at -20 °C for up to several months prior to staining. Carefully remove/pour off methanol and gently rinse retinas briefly in PBS (at this stage the retina is still in the same 2 ml tube from step 11 above). Remove PBS and cover retinas with 100 μl of Perm/Block solution (PBS + 0.3% Triton + 0.2% BSA) + 5% of appropriate serum (see Table 1) and shake gently for 1 hr. Remove Perm/Block and incubate retinas with gentle shaking overnight at 4 °C with 100 μl of selected primary antibodies (see Table 1) and/or IsolectinB4, all prepared by diluting in Perm/Block. Remove antibody/isolectin and wash retinas 4 x 10 min in PBS + 0.3% Triton (PBSTX). In some cases, e.g. following staining with IsolectinB4-Alexa488 or a directly conjugated primary antibody, a secondary antibody is not required and retinas can be mounted directly (step 7). When an unconjugated primary antibody has been used in step 3, then 100 μl of the appropriate fluorescent secondary antibody (diluted 1/200 in PBSTX) is added and left to incubate overnight at 4 °C or for 4 hr at room temperature. Remove secondary antibody and wash retinas 4 x 15 min in 2 ml PBSTX. Transfer retinas onto slides using a wide bore plastic Pasteur pipette and remove excess PBSTX with absorbant tissue. Mount retinas by adding 50 μl of Prolong mountant onto a coverslip and gently position over the retina. Transfer slides to fridge overnight at 4 °C, ensuring that they are flat and protected from light, to allow the Prolong mountant to set. Image retina using a confocal microscope or an epifluorescence microscope. 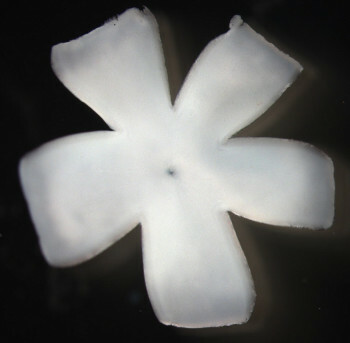 After dissection the retina should look like a flat flower (Figure 1). 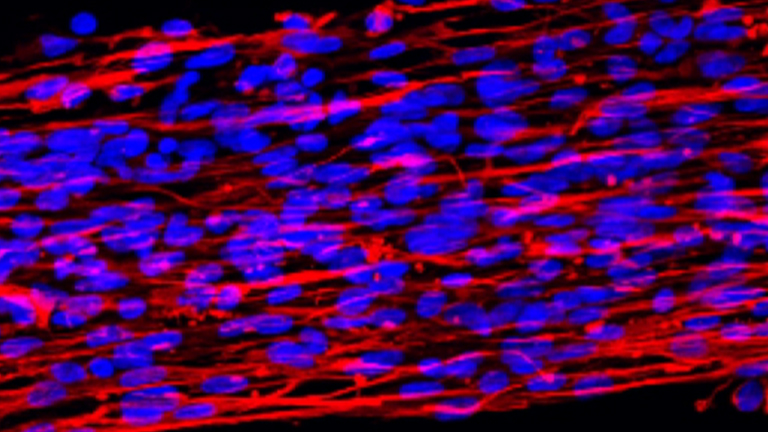 By using the protocol, outlined above, endothelial cells can be seen using isolectin B4-Alexa488 staining and supporting vascular muscle cells are visualized using anti-alpha smooth muscle actin (Figure 2). The low power view using a 5X objective in Figure 2 allows an overview of the vascular organization of the retina. Also, by using a different combination of antibodies given in the protocol above, endothelial cells can be seen using anti-CD31 immunostaining and supporting pericytes are seen using antibodies against NG2 (Figure 3) or desmin (Figure 4). Anti-desmin staining is useful for visualizing the finger like processes of the pericytes and determining whether they are closely associated with the endothelial cells. In contrast, anti-NG2 staining outlines the nuclei of each pericyte, which is useful when quantifying the number of pericyte cells on the vasculature. This would be done by counting number of cells per field of view using a high power (e.g. 60X) objective. If required, alternative combinations of antibodies can also be used (see Table 1); for example, anti-collagen IV is useful for visualizing the vascular basement membrane. Retinas that have been stained for endothelial cells can be analyzed for key features of angiogenesis such as the progression of the vasculature from the center towards the edge of the retina, the vascular density and vessel branching frequency. Figure 1. Appearance of a neonatal retina immediately after dissection and addition of methanol. This image is taken using a Zeiss Stemi SV6 and Axiocam HRc camera. Figure 2. Immunostaining of whole mount retinas (age P7) with Isolectin B4-Alexa488 (green) (A), anti-alpha smooth muscle actin-Cy3 (red) (B) or merged (C). These images are taken with a Zeiss axioimager and Axiocam HRm camera using a 5X objective. Note the alternating pattern of arteries and veins. Arteries are recognized by the capillary free zone that immediately surrounds them, and are coated with smooth muscle cells which stain positive (red) for alpha smooth muscle actin. Click here to view larger figure. Figure 3. Double immunostaining of whole mount retinas (age P6) with anti-CD31 primary antibody (detected with anti-rat IgG conjugated to Alexa488, green, A); and anti-NG2 primary antibody, detected with anti-rabbit IgG conjugated to Alexa 594 (red, B). These confocal images were taken using a 60X objective combining laser scanning images from 13 z slices, each of 0.47 μm thickness. An overlay of images in C shows CD31-positive endothelial cells (green) and NG2-positive pericytes (red). Click here to view larger figure. Figure 4. Double immunostaining of whole mount retinas (age P6) with anti-CD31 primary antibody (detected with anti-rat IgG conjugated to Alexa488, green, A); and anti-desmin primary antibody, detected with anti-rabbit IgG conjugated to Alexa 594 (red, B). These confocal images were taken using a 60X objective combining laser scanning images from 21 z slices, each of 0.24 μm thickness. An overlay of images in C shows CD31-positive endothelial cells (green) and desmin-positive pericytes (red). Click here to view larger figure. Table 1. Examples of primary antibodies for immunofluorescent staining of whole mount retinas. The method presented here offers a simple and efficient way to obtain images of stained whole mount preparations of neonatal mouse retinas, making it an easily quantifiable and physiologically relevant model of angiogenesis. Initially, the mouse eye can be quite difficult to dissect due to its small size and globe shape, so some practice and good dissection tools are needed for reliable results. Dissection of eyes prepared in 2x concentration of PBS is important because this causes a small amount of water loss from the eye and reduces the intra-orbital pressure, which facilitates dissection. Good preparation of the retina is important for several reasons. First it maintains the integrity of the vasculature. Second, if the hyaloid vasculature is not well removed it reduces the efficiency of the antibody staining, leading to high levels of background and decreased resolution. This problem may also occur if the PFA fixation time of the retina is too long. However, prior to staining, long term storage up to several months in methanol in the -20 °C freezer is suitable prior to isolectin staining and for most of the antibodies in Table 1. Although isolectin staining is rarely problematic, it does stain macrophages in addition to endothelial cells. For good immunostaining of whole mount retinas, the choice of antibodies is critical and the staining protocol must be adapted according to the antibody specificity and concentration, which may vary between batches when polyclonal antibodies are used. High background can usually be reduced by lowering antibody concentration, increasing wash time or adding more detergent to the wash steps. Antibodies are aliquoted on arrival and stored as indicated by the manufacturer. For those that are stored at -20 °C, a working aliquot is kept in the fridge to avoid repeated cycles of freeze thawing. If bright fluorescent spots appear on the stained specimen, especially if this is also present in the region around the tissue, this suggests precipitated aggregates of antibody are present which should be removed in all subsequent experiments by centrifuging the antibody for 10,000 rpm for 5 min prior to use. Some of the antibodies currently used by our laboratories are in the material list with the appropriate dilution (Table 1). Choosing a compatible combination of antibodies is very important to avoid unwanted cross reaction between primary and secondary antibodies. Cell proliferation can be monitored by injecting mice with a solution of BrdU approximately two hours prior to harvesting the tissue. This thymine analogue is incorporated into proliferating DNA and can be detected using a specific anti-BrdU antibody, as previously described 8. Each retina is very fragile, but can be stained for different vascular markers by treating the tissue gently whilst working through the protocol. A number of controls are included in each experiment to show specificity of staining. Untreated retinas will reveal the degree of autofluorescence in the tissue, which should be minimal. A no primary antibody control will allow determination of non-specific binding of the secondary antibody to the tissue. Retinas that have been accidentally torn during dissection can provide useful tissue for controls. After mounting, fluorescent staining is retained for several days as long as the slides are stored at 4 °C in the dark. Imaging by epifluorescent microscopy is improved by the use of an apotome, which removes out of focus light. Alternatively, confocal microscopy provides accurate cell-specific imaging (Figures 3 and 4). This method has many possible applications. It can be applied to mice in which key genes that regulate angiogenesis are depleted, including work that uses inducible Cre-loxP genetics 8-10. Alternatively retinal angiogenesis can be interrogated following drug treatments delivered either systemically or intra-ocularly to investigate their pro- or anti-angiogenic effects 11. It is also possible to take advantage of the transgenic tools available and use GFP or RFP transgenic mice to visualize key elements of the retinal vasculature 11,12 . (Note that fixation using 4% PFA in PBS for 1 hr at room temperature is used in place of methanol for step 2.12 of the protocol prior to imaging endogenous GFP or RFP in retinas from transgenic mice.) Furthermore, in order to study molecular signalling mechanisms, it is useful to visualize the mRNA expression of specific genes in the retinal plexus using in situ hybridization 13. This work was funded by the Wellcome Trust and the British Heart Foundation. Anti-alpha smooth muscle actin-Cy3 (clone 1A4, mouse monoclonal) Sigma C6198 Detects vascular smooth muscle cells. Goat anti-rabbit-Alexa594 Invitrogen A11012 All secondary antibodies are aliquoted immediately on arrival and stored at -20 °C. Goat anti-rat-Alexa488 Invitrogen A11006 All secondary antibodies are aliquoted immediately on arrival and stored at -20 °C. Goat anti-rat-Alexa594 Invitrogen A11007 All secondary antibodies are aliquoted immediately on arrival and stored at -20 °C. Goat anti-mouse-Alexa488 Invitrogen A11029 All secondary antibodies are aliquoted immediately on arrival and stored at -20 °C. Donkey anti-goat-Alexa594 Invitrogen A11058 All secondary antibodies are aliquoted immediately on arrival and stored at -20 °C. Carmeliet, P., Jain, R. K. Molecular mechanisms and clinical applications of angiogenesis. Nature. 473, (7347), 298-307 (2011). Staton, C. A., et al. Current methods for assaying angiogenesis in vitro and in vivo. Int J. Exp. Pathol. 85, (5), 233-248 (2004). Goodwin, A. M. In vitro assays of angiogenesis for assessment of angiogenic and anti-angiogenic agents. Microvasc. Res. 74, (2-3), 172-183 (2007). Lawson, N. D., Weinstein, B. M. In vivo imaging of embryonic vascular development using transgenic zebrafish. Dev. Biol. 248, (2), 307-318 (2002). Fruttiger, M. Development of the retinal vasculature. Angiogenesis. 10, (2), 77-88 (2007). Sawamiphak, S., Ritter, M., Acker-Palmer, A. Preparation of retinal explant cultures to study ex vivo tip endothelial cell responses. Nat. Protoc. 5, (10), 1659-1665 (1038). Mahajan, V. B., Skeie, J. M., Assefnia, A. H., Mahajan, M., Tsang, S. H. Mouse eye enucleation for remote high-throughput phenotyping. J. Vis. Exp. (57), e3184 (2011). Pitulescu, M. E., Schmidt, I., Benedito, R., Adams, R. H. Inducible gene targeting in the neonatal vasculature and analysis of retinal angiogenesis in mice. Nat. Protoc. 5, (9), 1518-1534 (2010). Allinson, K. R., Lee, H. S., Fruttiger, M., McCarty, J., Arthur, H. M. Endothelial expression of TGFbeta type II receptor is required to maintain vascular integrity during postnatal development of the central nervous system. PLoS One. 7, (9), e39336 (2012). Mahmoud, M., et al. Pathogenesis of arteriovenous malformations in the absence of endoglin. Circ. Res. 106, (8), 1425-1433 (2010). Lebrin, F., et al. Thalidomide stimulates vessel maturation and reduces epistaxis in individuals with hereditary hemorrhagic telangiectasia. Nat. Med. 16, (4), 420-428 (2010). Pi, L., et al. Role of connective tissue growth factor in the retinal vasculature during development and ischemia. Invest. Ophthalmol. Vis. Sci. 52, (12), 8701-8710 (2011). Powner, M. B., et al. Visualization of gene expression in whole mouse retina by in situ hybridization. Nat. Protoc. 7, (6), 1086-1096 (2012). Thank you for an excellent tutorial on whole mounting of neonatal mouse retina! I was wondering: when you are mounting the dissected retina on the object glass after several steps of washing/staining, how can you tell that you mount it the correct way and not upside down? Hello, the protocol was really excellent for retina staining of neonatal pups when I have tried ! Here I have some questions that confuse me.1: if I want to dissect the retina for western blot or real time PCR,whether I can use the 2X PBS, will it affect the mRNA or the protein? 2: The eyes followed by the 2x PBS after fixation usually will stay more than 10 minutes, because I fixed eyes in the 4% PFA after euthanasia in the vivarium room,which often means eight or ten eyes meantime, it takes a maybe 1 hour to dissect all the retinas. how I can deal with the issue?or just put the eyes which I cannot dissect meantime in the 1XPBS (cold) first ,when I need to dissect it ,then transfer the eye into 2XPBS 5-10 minutes ahead .3:Recently I have done lots of whole mount retina staining ,but the protein like GIT1 or VEGFR3 or ERG almost can not be stained ,I prolonged the time of primary antibody included the secondary antibody ,but still fails.I was wondering the co-staining of two or three primary antibody will interference each other or I need increase the concentration of Triton? I am struggling with the issue,and I have already avoided the interact of secondary antibody. 1. For RNA extraction, I dissected unfixed retinas in 1xHBSS + 0.1%BSA +2mM EDTA on ice . 2. I staggered the enucleations by 1 min per eye, so that all eyes were fixed for exactly 10 min. The eyes are held in 2XPBS on ice during the rest of the removals. Posted by: Kathleen R A. 1. For qPCR, I have dissected the retinas in: 1xHBSS +0.1%BSA +2mM EDTA on ice, without fixation of the eyes. 2. I staggered the dissections of each pup by 2min ( or however long it takes to remove the eyes), so all the eyes have exactly 10 min fixation. After this, the eyes can stay in cold 2XPBS on ice during the retina dissections. 3. Often it is the fixation step or the methanol storage steps which can interfere with the staining. Don't fix for longer than 10 min, and try staining immediately after dissection, rather than store in the freezer.